This smiling face is not me, even though people have made that mistake in the past. This is Julia, the girlfriend of my baby-brother, Josh (and, for the record, he calls her “Julia-Ghoulia.” Because he’s a goober). Because it’s nice to have context: she’s an architecture student, is the only person to ever make me GF cookies, has a wicked corner kick, is GOING TO SPAIN NEXT SUMMER, and once we shared a “sick room of sickness” on an incredible New Year’s Retreat. These are clearly important things. Also, if you follow her on Twitter you can read about her family’s ducklings and it’s every level of cute. Julia shows off her cute little outfit. I asked if she’d like to be featured in a “What I Wore Wednesday,” and she obliged because she’s cute like that…even though it is the middle of crazy for her at Architecture school. “So, tell me about your outfit,” I said. “Well, pretty much all of it is thrifted. Or handed along to me,” she said. But, Julia also doesn’t care. “It’s just who I am,” she shrugs. Knowing and embracing who you are is the best. Julia told me she digs vibrant colors in the winter time. Can I get an “Amen!”? It’s all about the vibrant colors in the winter time. It lifts the spirit. These shoes! Black with buttons and crisscrossed elastic. As for her shoes, they used to be used by her younger sister as the Polish dance shoes. However, her sister no longer is a part of the Polish dance troupe, so Julia used the shoes instead. 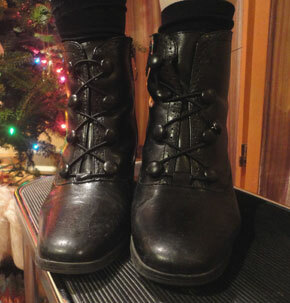 She likes to wear them with socks because she thinks tights+socks+boots = love. Different people have different style visions, and I asked Julia about hers. She says she digs the peasant-girl look, as we see in her top…but she also says she mixes it with a 90’s punk rocker attitude. This, my friends, is what makes people so interesting. Peasant + 90’s punk rock?! That’s style right there. The day Julia wore this she received reviews of her architecture designs, and then went out for a night on the town. I asked Julia what inspires her fashion and she said she believes in “looking cute at all times.” 🙂 She shared she dresses up for school because it helps her feel good about herself and therefore she accomplishes more. There you have it. Remind me to get rid of my not-cute clothes. They’re stifling my productivity. Real talk. 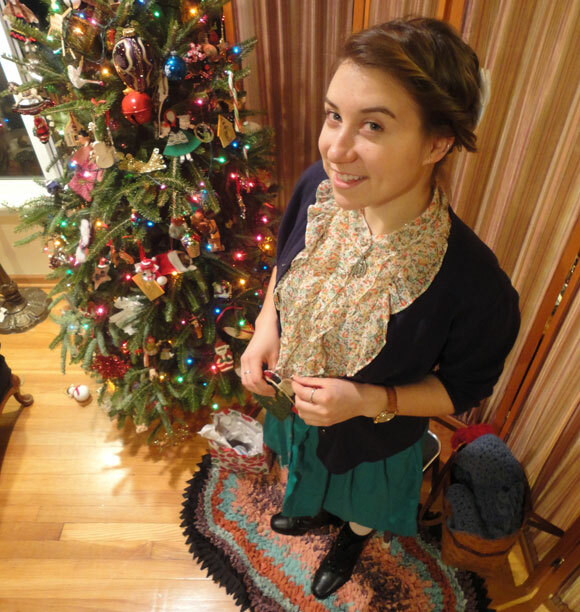 Julia sports a floral top, a navy cardigan, her green pocketed skirt, white tights, and black boots. Ooo la la Christmas spirit!